At Evavi, we are unlocking previously inaccessible value in supply chains by combining innovative new technologies with a team that architected the worlds leading supply chain applications. We are the first to solve supply chain problems in a fully synchronized fashion without a disconnect between planning and execution. This alternative to legacy supply chain management software changes what is possible. Our supply chain solutions enable seamless planning, execution, collaboration, and coordination across the extended supply chain. We have built all of our solutions from the group up for optimal flexibility and performance on our internet-native real-time platform utilizing open standards. We parted ways with rigid technologies and legacy code bases to start fresh. Our fresh approach is called Supply Chain Synchronization. Evavi Supply Chain Synchronization includes four primary modules: Synchronized Information Management, Synchronized Demand & Supply, Synchronized Demand Fulfillment, and Synchronized Reverse Logistics. Supply chain success requires matching supply to demand. Success depends on the ability of an enterprise to forecast, plan, and procure effectively. With traditional enterprise applications, these core business processes remain disconnected from one another, preventing critical supply chain functions and information from seamlessly extending across the enterprise. This leads to inefficiency, errors, excessive costs, delays, and multiple other problems. Evavi Synchronized Demand & Supply provides visibility across the enterprise and compresses the cadence of a companys supply chain. Fulfilling demand rapidly and accurately is essential to ensuring a great customer experience. Your customers depend on you to deliver products flawlessly, but when you have hundreds or even thousands of customers and products, this can be an ongoing challenge. To keep pace with rapidly changing customer needs, the demand fulfillment process must be flexible, extensible and scalable. Evavi Synchronized Demand Fulfillment delivers a comprehensive solution to meet and exceed todays order management requirements. The Evavi solution enables the seamless capture, validation, processing and planning of every order through the enterprise accurately and profitably, while giving users complete visibility and control of the order at every stage. Delivering a complete, fast, scalable, and extensible solution to meet your current and future returns management requirements. Easily setup returns programs and rule-sets, minimize invalid returns, and speed returns rapidly through gate-keeping, qualification and disposition — all while maximizing productivity and keeping inventory levels and operating costs in check. As with all Evavi solutions, Evavi Synchronized Reverse Logistics is powered by Evavi Fabric™ to deliver the highest levels of synchronization and native flexibility for your extended enterprise. Let Evavi Synchronized Reverse Logistics turn your returns management operations into a true competitive advantage. 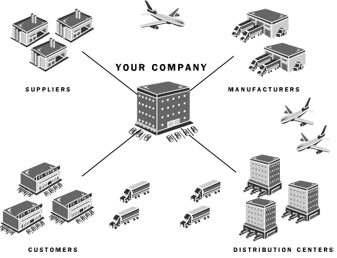 Capacity and material information is at the heart of supply chain management. Supply chain management is data intensive and the required data often originates in many different and disconnected systems. Product information, for example, is complex, often incomplete, and highly distributed. Supply chain data are dynamic and always will be. Supply chain software must assimilate the data from a variety of sources; integrate, clean, and manage it, and then flow it seamlessly through the supply chain in real-time. Evavi Synchronized Information Management ensures comprehensive, reliable data for flawless supply chain planning and execution.